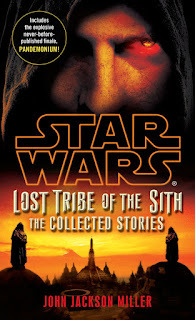 Lost Tribe of the Sith Collected Edition and "Secrets" revealed! Houston — we have a cover! Or two! 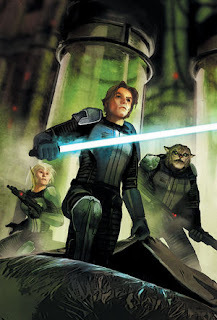 The official Star Wars blog has released information about my upcoming Star Wars: Lost Tribe of the Sith: The Collected Stories, which is coming out July 31 from Del Rey. They've also posted the cover and description for "Secrets," the eighth digital download in the series. Click here to see the blog post, which has the larger cover reveals! As previously announced, the collected edition has, among other surprises, a big new novella from me, "Pandemonium." As to when it's set and what it's about — the Secrets story will have a lot to say. Secrets follows aged Varner Hilts as he seeks some way to keep the Lost Tribe from collapsing further into chaos. The free eBook will be available on March 5 and features an excerpt from Star Wars: Fate of the Jedi: Apocalypse, the final installment in the epic Fate of the Jedi series. It's going to be a mammoth of a paperback — 432 pages, bigger than Knight Errant! There will be a digital version as well, for purchase; the package will have quite a lot that is new. Pandemonium is larger than the size of four of the Lost Tribe ebooks combined— so a full third or more is new material. And there may be some other goodies. Lost Tribe: The Collected Stories is available for preorder now from Amazon! There's also the Kindle edition. 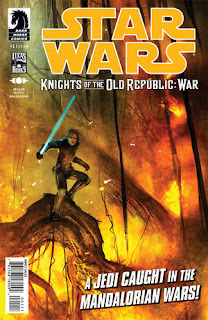 And don't forget the Knights of the Old Republic: War series — issue #1 is on sale now. I'll have notes online about it soon. When's it set? It's 3,962 years before Star Wars Episode IV. This is a period where the Republic has, until recently, been robust and unchallenged; the Sith aren't on the scene. But the Mandalorians, the armor-wearing nomads who established the Boba Fett tradition, are on the move, and have now taken on the Republic itself. Who's Zayne Carrick? Zayne is nineteen years old, and was once a Jedi student. He wasn't talented in the traditional ways and would have had trouble making the grade — but then a long series of events resulted in his breaking out on his own, helping the helpless along the way. He made a lot of friends and a few enemies: you can read more about them on my individual pages for the issues — and of course in the books themselves. Follow the links from my shop to find copies, all nine volumes are still available. What's happened to him now? He's been drafted by his homeworld to fight the Mandalorians — which is rough, because Zayne doesn't believe in killing. That becomes a major element of Knights of the Old Republic - War. What happened to Zayne's friends from the original series? The draft board only wanted Zayne! Seriously, we'll find out as we go along. What's it got to do with the video game and online RPG? The comics are set several years before the first Bioware video game, and a couple hundred years before The Old Republic. But it's all part of the same history, and there are connections here and there. Why have I seen two covers for the first issue? Because there are two! The more common cover is the Benjamin Carré one with the fire on the cover (an actual scene from the issue). The other one is also available from your retailer, and from Things from Another World — follow the image link at the bottom of their menu page. Where do I find the series? At your local comics shop — find it here — or from Things From Another World. Enjoy! See you in the shop tomorrow — and on Twitter. With Star Wars: Knights of the Old Republic - War #1 going on sale on Wednesday — cover for #3 is at right — I have done a whole lot of interviews and podcasts in recent days — and for Tuesday, Dark Horse has slated a Live Twitter Conversation for me, using the hashtag #KOTORWarChat. Prizes available: Dark Horse is giving away digital copies of the issue itself to five lucky winners who post. Details here, and remember you can always find me on Twitter here. There was some variety in the questions, so there's variety in the answers. More to come, believe it or not! There's a page on the site now for Knights of the Old Republic - War #3; the cover is above. The solicitation for #4 is just out too, I think. Also, this is pretty long overdue, but I finally have a page online here for Star Wars Omnibus: At War With the Empire Vol. 2, which collects a whole bunch of comics including my very first Star Wars work, "Model Officer" from 2005's Star Wars: Empire #35. You can get the book from Amazon, Things From Another World, or your local bookseller.